Long before the first shooting stars, two winter elves, that could never agree, lived on this earth. One thought that the sun shone the longest whilst the other one was convinced that it was the moon that shone the longest. 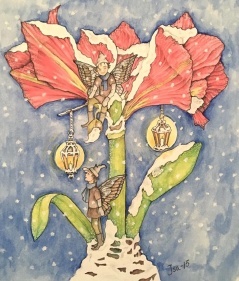 One day, they heard an Amaryllis Bud wailing: "Please winter elves, if you both warm me during the winter then I promise I will tell you which one shines the longest" Immediately the winter elves started to warm the Amaryllis bud. The heat made the Amaryllis grow and one day her buds blossomed into a beautiful winter flower. She said, "Because of your kindness, I have now received the most precious gift ever - the power to grow, and I want you both to know that the sun and the moon shine just as long as each other"
The two elves counted the sun and moonbeams throughout the next day. And believe it or not, they were totally astonished when they realized that the Amaryllis was right. At the same time, they were also thankful. Finally they could be friends! A few days before the spring equinox, both night and day are of equal length. What we believe in should not stop us from living together. The main thing is that we can distinguish between good and evil.